Hi friends! I hope you had a great week! Today, we'll be heading to the pumpkin patch for a field trip with Brady's class. The kids are really excited to be going! I can't wait to take pictures of them! Here's a tag I made with the Ippity alphabet set. The spider card is a free printable from Whisker Graphics, you can find it HERE. I misted the tag with some shimmer mist and added some black cardstock and bling. The tassel is made from Halloween Divine Twine and Black Licorice Divine Twine. Be sure to check out the Unity Blog to see everyone participating in today's hop. LEAVE COMMENTS on each blog because there's a prize hidden! Have a great weekend everyone! Wonderful, fun tag! Love the misted background and the twine! Super cute tag, Ashley!! 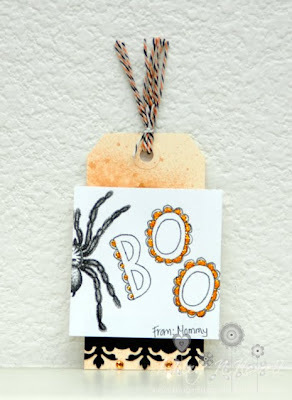 Love the twine treatment & fun word "boo" on the spider card! Spooky mixed with cute, great tag! Very cute Ashley! Love the coloring on the BOO sentiment! Cute, cute tag! But... that spider is a wee bit too realistic. ;) Have fun at the patch! So fun Ashley! Great little details. Ashley, I love all the details on this little tag! I've never seen two colored twine... I must have some, hehehe! TFS! Oh this is a super cute tag!! Really cute tag! The twine is perfect! Super duper cute!!! LOVE the misted background! FAB FAB FAB tag:) Can't wait to meet with you in the morn--I have an appointment at 8-I should be on by 10! I so love this fabulously fun Halloween Tag. That spider looks so real and scary.